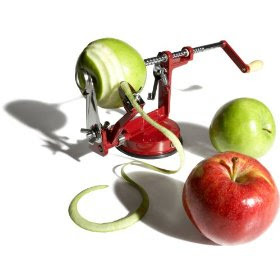 When my son was old enough to eat apples on his own I purchased this funny contraption that peeled, sliced and cored them all at the same time. Not only was it quick and easy but it did a much better job than I could do with paring knife. The bonus, my son found it extremely amusing and he was asking for apple slices all the time. Now I'm not a great baker but I'm quickly learning that my friend Zarah is amazing at it. She went apple picking this Fall and made this tarte Tatin that was to die for. Thinly sliced apples on a delicate pastry. Heavenly with a scoop of vanilla ice cream! What immediately came to mind when I saw her dessert was the apple contraption. It would make baking with apples a breeze. I may have to start practicing! Thanks for the inspiration, Z.